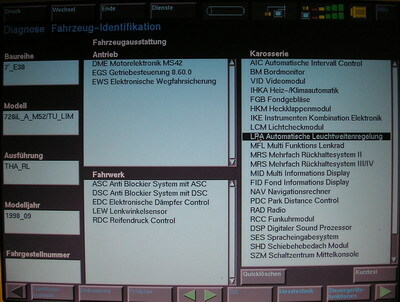 Contains Technical Information System (TIS)...this includes technical literature of repair manuals (from E36), Service Information Bulletins (from 1988), Technical Reference Information Bulletins (from 1988), Technical Data, Tightening Torques It uses a 486DX2/50MHz running on a UNIX based operating system. Monitor is a touch screen type. 500mb hard drive, one 3 & 1/2" floppy disc drive. Two CD ROM drives. Two Future expansion slots. Contains backup batteries, Air conditoning unit, printer, MoDiC station, and various diagnostic cables.